Averaging approximately 110 daily flights with nonstop service to 23 airports, BUF plays an essential role in the development of business and tourism in the Buffalo Niagara region. Greater Rochester International Airport (ROC) is located four miles southwest of Rochester, N.Y., and 12 miles south of Lake Ontario, one of the largest of the Great Lakes. The airport is served by 10 airlines and regional jet services offering nonstop flights to destinations in the U.S. and Canada. ROC airport’s main terminal building has two levels – ticketing and boarding gates on the upper level and baggage claim and rental cars on the lower level. 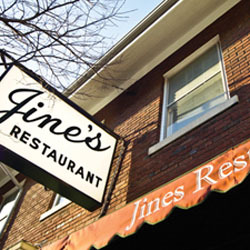 Located in the cultural and historic Park Avenue area of Rochester, New York, Jines Restaurant serves breakfast, lunch or dinner any time of the day. At Jines, we provide a friendly and comfortable atmosphere with consistent, high quality food and service. Whether you're in the mood for a grilled filet or a grilled cheese, Jines is an upscale diner with something for everyone. We also have a great wine and draft beer selection, including hand-crafted microbrewed beers. Sooner or later everybody dines at Jines, stop by today. NFIA (IAG) is an attractive alternative to currently congested major North American International airports. With its 10,825 ft. main runway, 5,850 ft. crosswind runway, 24-hour operation (no curfews), 24 hr. CFR service, excellent access to inspection agencies, and price competitive landing fees, the NFIA is ideally suited and strategically located to accommodate various types of aviation operations. The close proximity of the airport to the Canada/USA border, its location just off a major highway, and its central location to the Canada and USA population base, offer great operational advantages. In addition, there is an excellent local labor force and the presence of over 300 freight forwarders in the airport vicinity makes freight operations a natural fit for this airport. The NFIA is located right off off Route 62 (Niagara Falls Blvd. ), which connects easily with U.S. Interstate 90 and the 405 in Canada. The Inn on the Lake Resort & Conference Center has distinguished itself as a unique year-round getaway for business events and personal relaxation. Nestled on the shore of Canandaigua Lake in the heart of the Finger Lakes region, The Inn on the Lake combines traditional warmth and elegance with modern-day conveniences unlike typical Canandaigua Hotels. As a guest of The Inn on the Lake Resort & Conference Center you will find yourself in the center of an incredible range of unique attractions. Toronto Pearson International Airport (YYZ), also known as Lester B. Pearson International Airport or simply Toronto Pearson, is a major international airport serving Toronto, Ontario, Canada. It is situated 27 km (17 mi) northwest of Downtown Toronto in the city of Mississauga, Ontario. It is the primary airport for a densely populated metropolitan region in southern Ontario, including the Greater Toronto Area, situated within the Golden Horseshoe. Pearson is the largest and busiest airport in Canada. In 2009, it handled 30.4 million passengers, a 6.1% decrease compared to 2008, and 407,724 aircraft movements. It is currently the 20th busiest airport by aircraft movements in the world. In 2008, it handled 32.3 million passengers and 429,262 aircraft movements. In 2006, the airport was selected as the best global airport by the UK-based Institute of Transport Management. Lester B. Pearson International Airport is the primary hub for Air Canada, making it a major Star Alliance hub airport. It also serves as a hub for Air Canada Jazz, Air Georgian, Air Transat, Fedex Express, Sunwing Airlines and WestJet. The airport is operated by Greater Toronto Airports Authority as part of Transport Canada's National Airports System and is one of eight Canadian airports with facilities for United States border preclearance. An extensive network of daily non-stop domestic flights is operated from Pearson by several airlines to all major and many secondary cities across all Provinces of Canada. It also has a very strong international presence, with 74 airlines offering non-stop or direct service to over 100 international destinations throughout the United States, Mexico, Asia, Europe, South America, Central America, the Caribbean, the Middle East and Oceania.